I was recently in the Forest of Dean in Gloucestershire in England on a crazy adventure with Forest Holidays. 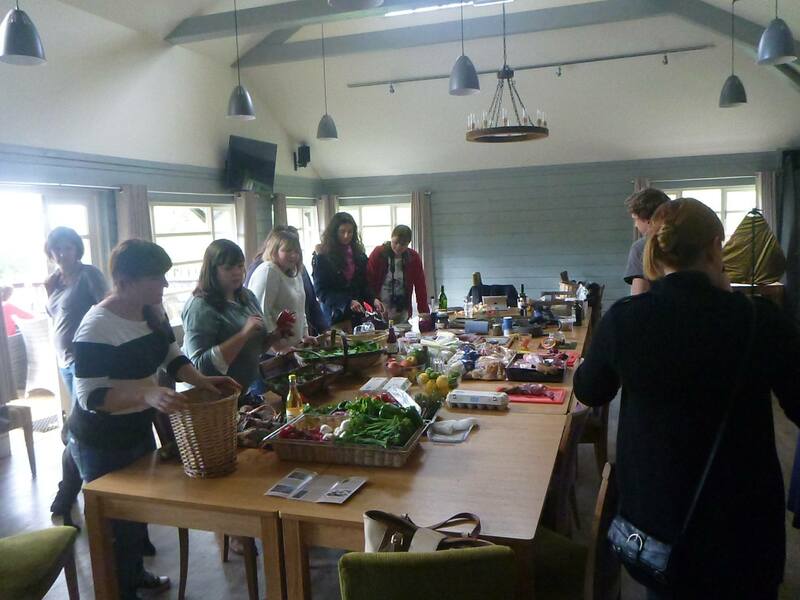 We had a night in log cabins in the forest, a night vision tour of the forest with the ranger Gerry, a foraging for food tour of the forest and a live wild food cooking demonstration from Nick Weston of Hunter Gather Cook. After the live wild food cooking demonstration, it was our turn to put our ideas into practice and create our own meals. 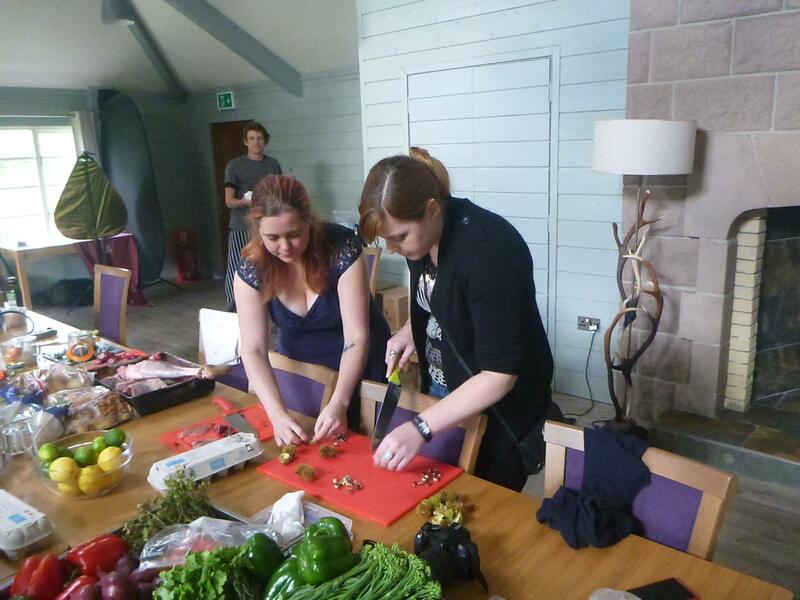 I teamed up with Helen from HelsBels blog and Chloe Gorman from The Gastronomic Gorman and we decided to make stuffed partridge breasts. In the morning we had foraged for lots of wild food including garlic, edible leaves, nettles and berries. Nick had also brought some deer and partridge for us to add meat to our dishes. 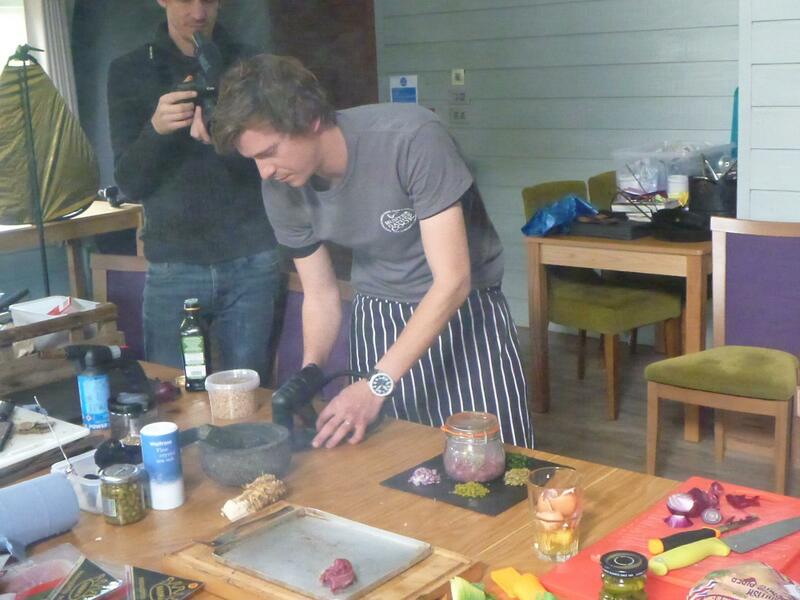 First of all Nick showed us how to skin the partridge, which was easier than I expected (video below). 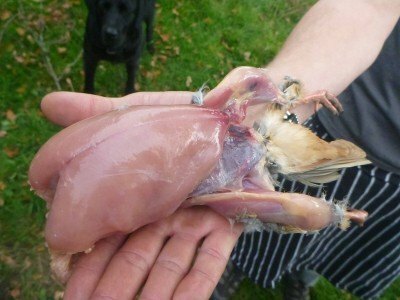 Then I put my butchery skills to the test by dissecting the partridge to bring out the meat. I chopped the two partridge breasts out and then we cut out the liver and kidneys. 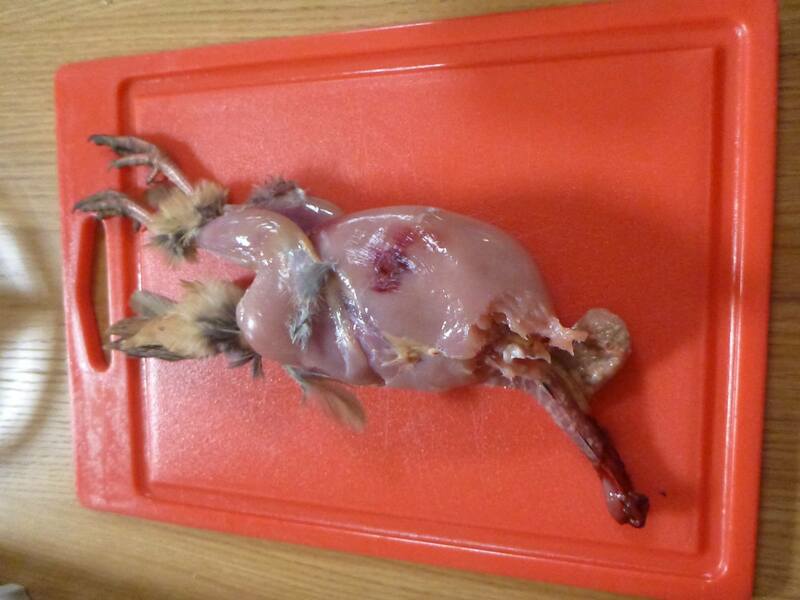 At one point we thought we could cook and eat the heart of the partridge, but what we thought was the heart was actually its stomach so we binned that part along with the feathers, skin, bones and head. We then used the leg meat on the partridge. The breasts were a decent size to be served as a starter, the leg meat was minimal. Helen and I both don’t like mushrooms, so we ignored the mushroomy tasting leaves we had foraged while Chloe used them in her recipe. So each breast of the partridge would be a slightly different recipe. We decided to stuff the partridge breast and wrap it with a slice of parma ham. 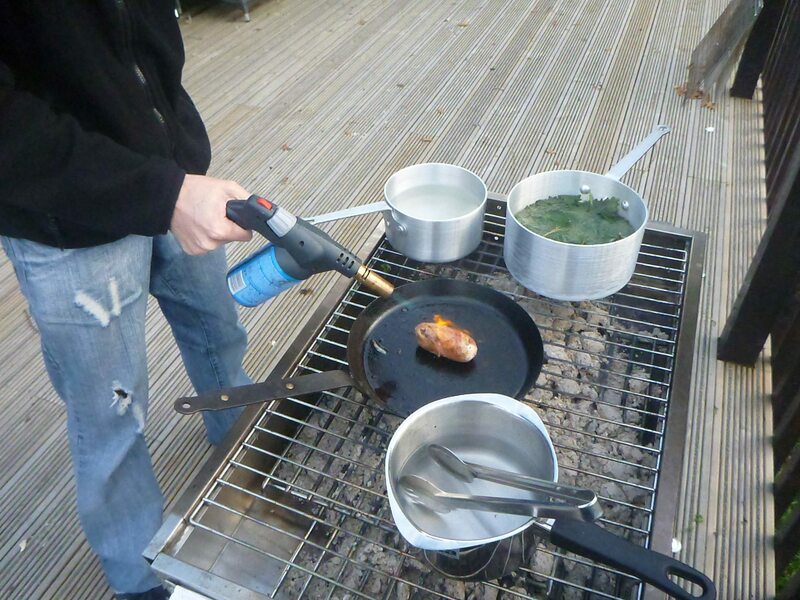 It would then be fried, poached and heated with a blow torch. For stuffing we used chestnuts, red onions, garlic, breadcrumbs and olive oil. There were a few time constraints on the day and obviously it would have been nice to slow roast it in the oven. 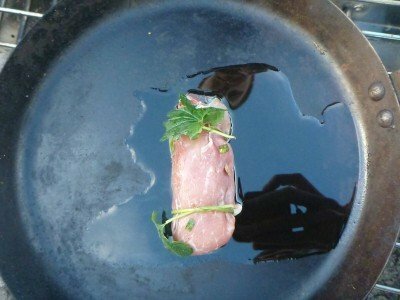 Instead Helen wrapped it in cling film and we tried to boil and poach it first off. 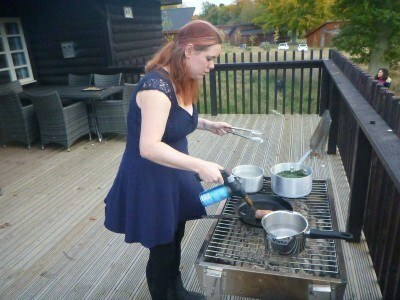 Then we put it on the frying pan on the barbecue and fried it. As the meat began to look almost done, we applied a simple yet really effective tactic. 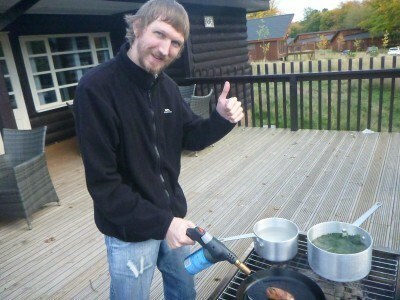 We finished the cooking with a blast from the blow torch. 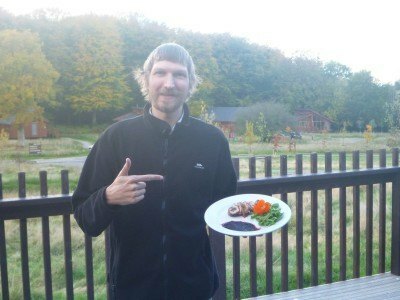 On the side I prepared a fresh blackberry and loganberry sauce from food we had foraged. We added some leaves and a pretty flower to the top and it was ready to serve. We worked on the dishes together, but Chloe’s version was the one with the mushroomy leaves, so I didn’t try it. 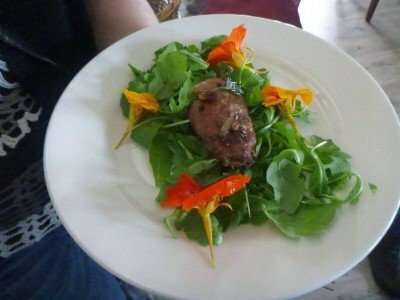 Here is the stuffed partridge breast placed on rocket leaves, ready to serve. 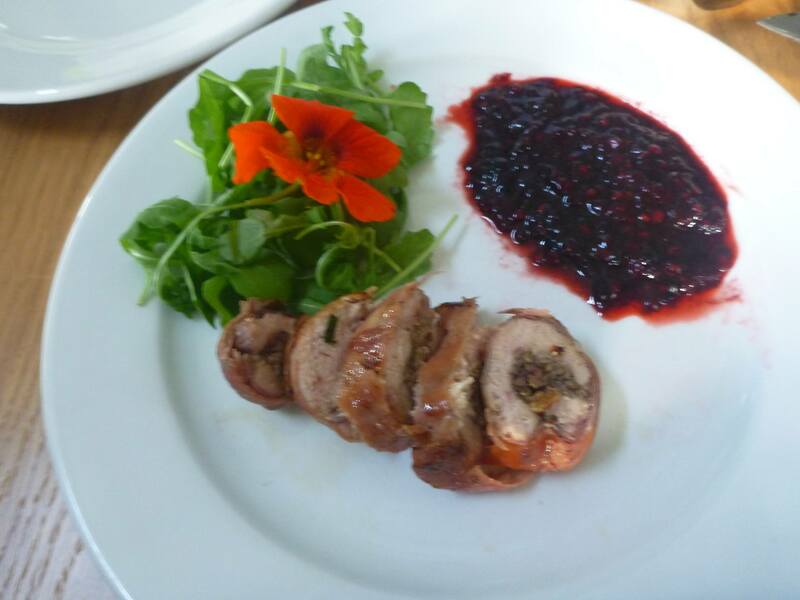 The stuffed partridge breast was more of a starter than a main course, but when we finally tasted it, it was sheer delicious! It was a huge surprise and obviously nice that the food we had created from wild products tasted good and well worthy of a place on any restaurant menu. Thanks to Nick from Hunter Gather Cook and Forest Holidays for this marvellous cooking opportunity in the Forest of Dean in Gloucestershire in England. This entry was posted in Daily Features, England, Europe, Forest of Dean, Friday's Featured Food, Gloucester, Gloucestershire. Bookmark the permalink. 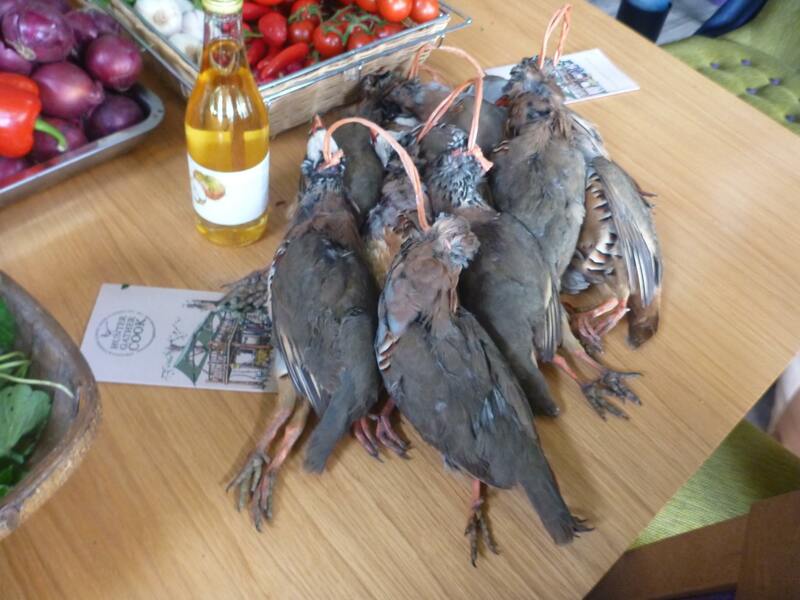 To say you’ve had partridge is one thing, but to say that you de-feathered, cooked, and prepared your own partridge is another. Awesome story! Did you feel squeamish at any point of the cooking process? This was a good trip, I really enjoyed prepping the partridge and it was delicious with the offal. If it wasn’t for the fact that I’m so cack handed and value my fingers for bowling, I’d be interested in learning how to butcher properly.